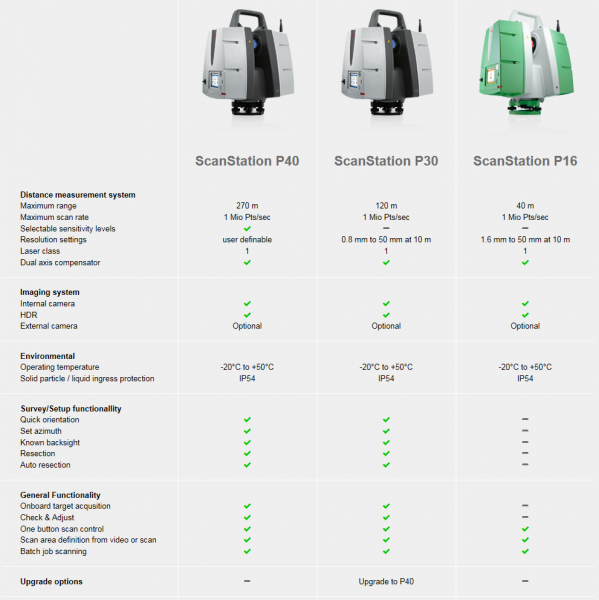 Earlier this month, Leica released their new line of ScanStations: the P16, P30, and P40. The two big sluggers to look out for are the P30 and P40. With a retooling of hardware, Leica's new scanners have achieved a new level of detail at range that their predecessors have not produced before. The P16 is advertised as an entry-level scanner, which will allow first time users and small project users the advantages of incorporating HDS tech into their workflow where as the P30/P40 options refine what already is working for Leica. The qualities of previous Leica ScanStation models P20 and C10 have been combined and refined in the P30 model, reducing noise and increasing accuracy. Additionally, the P40's range is beefed up to a respectable 270m. The new models have an HDR camera built in and an onboard touchscreen display. As to be expected from Leica, all 3 scanners have some killer specs. Compare the P20 and P30 data sheets on Leica's website however and you will be hard pressed to find much of a difference looking at the specs alone. Upon viewing a comparison of noise data captured by each of the scanners, it is clear that the retooling of the P30s hardware has given it a leg up on the P20 and C10. The future of 3D laser scanning is looking bright and Leica is making progress toward the development of powerful new tech for the industry. With the explosion of new hardware and software on the market, this is only one of the releases we are keeping our eye on and we're excited to see what's next. What cutting edge products are you excited to get your hands on and what are your thoughts on Leica's newest ScanStations? Leave a comment bellow and join the discussion at Laser Scanning Forum.